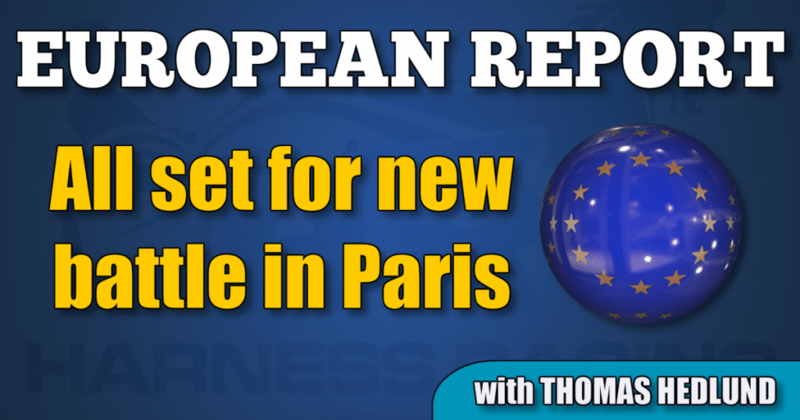 As tradition says, the next top race during Paris’ winter meeting is scheduled two weeks after the Prix d’Amérique and it’s, generally speaking, a rerun of that race when the $398,000 Prix de France place this Sunday at Vincennes. Prix d’Amérique winner Belina Josselyn will try to defend her title in Prix de France and Jean-Michel Bazire’s mare will start from post one behind the gate. The Prix de France is held over 1.3 miles and nine trotters begin from the first line behind the gate. The PdA runner up, Looking Superb, also from Bazire’s stable, will start from post 10 in the second line. Stefan Melander’s Nuncio (Andover Hall) got full book for the breeding season last year when he retired from competition. Earlier this week, the multiple stakes winning stallion noted his first foal in Sweden. The mare Ursula Knick (Ready Cash) gave birth to a colt. Norwegian-bred Lionel, trained by Daniel Redén, has ended his career on the tracks. Owner Göran Antonsen decided, in consultation with the trainer, that Lionel (Look de Star) will go back to Norway for some rest and breeding duties. Lionel ended his racing career with a lifetime earnings of $1,830,000 and last fall, the Look de Star stallion finished second to Cruzado dela Noche in International Trot at Yonkers.